Ensemble Theatre presents NEIGHBOURHOOD WATCH by Alan Ayckbourn at the Ensemble Theatre, Kirrribilli. Reading about Alan Ayckbourn there are some 'claims' that after Shakespeare, Mr Ayckbourn is the then next most performed playwright in the English speaking world. Mr Ayckbourn was born in 1939 and is still writing for the theatre and has now a list of 77 plays, the last being ARRIVALS AND DEPARTURES performed in August, 2013. It premiered in the theatre that has been the incubator of most of his work, the Stephen Joseph Theatre in Scarborough. Looking at some of his play titles, one can grasp the writer's quality of impact, and understand the SIR that was bestowed in front of his name by the Queen, in 1997, and estimate that it is ,indeed, justified: ABSURD PERSON SINGULAR (1972), THE NORMAN CONQUESTS (1973), BEDROOM FARCE (1975), JUST BETWEEN OURSELVES (1978), A CHORUS OF DISAPPROVAL (1984), WOMAN IN MIND (1985), A SMALL FAMILY BUSINESS (1987), MAN OF THE MOMENT (1988), THE REVENGER'S COMEDIES (1989), HOUSE AND GARDEN (1999). NEIGHBOURHOOD WATCH was first presented in 2011. Mr Ayckbourn's plays concern themselves, mainly, with the middle classes of England, across the three stratas of that class - upper, middle and lower - and the jostling for 'position' by the people in them for dominance (of any kind), and observing usually, with forensic accuracy, the gender 'wars' that, also, are going on - underlining the interplay between truth and artifice in our every day lives. There is, resultantly, a great deal of comedy that make these plays uproariously funny, and have given Mr Ayckbourn huge popular success. But, because of that accuracy of observation they, often, transcend the subject matter and genre and can be read as bleak, dark and tragic experiences, as well - the audience, are, given pause, cause, to ponder, their extended families' world and domestic politics. The writing of WAY UPSTREAM (1981), in hindsight, registers a change of emphasis, focus, in the writing interests of Mr Ayckbourn. The subsequent plays, more and less, moved from plain realism into the field of allegory, with a pre-occupation to face the 'evil' in the world, represented by characters who want 'power', and are prepared to manipulate the world about them to achieve it by whatever means possible. The plays register an assumption that power and evil are two sides of the same coin, and although the plays retain their comic aura, they are sharpened with a moral and social irony, so that they develop questions about the prevailing moral and ethical benchmarks, about us. Enter, then, on the Ensemble stage, NEIGHBOURHOOD WATCH, (so, interestingly different from the pre-occupations of Lally Katz and, I suppose, the Belvoir artistic movers and shakers, with their NEIGHBOURHOOD WATCH play, I, passingly, observed to some friends). An unmarried brother, Martin (Brian Meegan) and sister, Hilda (Fiona Press), both in their fifties, and both devout Christians, move into a neighbourhood estate called Bluebell Hill, into a house with a panoramic vista of the countryside, slightly blighted by the intrusion of the physical, visual presence of another community, ironically called, Mount Joy - it, decidedly in 'distress'. It is the misunderstood intrusion of a Mount Joy denizen - a young boy - into the back garden of the new arrivals, that is the catalyst to the formation of a Neighbourhood Watch committee. The committee is made up of a small group of ordinary, apolitical human beings who find some satisfaction to being part of something, to fill in their days - the other residents are generally disinterested and/or apathetic. Dorothy (Gillian Axtell), a retired administrative employee of the local newspaper, and avid observer of the goings-on of her neighbours; Gareth (Jamie Oxenbould), a pathetic handy-man, obsessed with medieval instruments of torture e.g. the stocks - it turns out his interest is not only of their history but, also, of their re-creation (! ); Amy (Olivia Pigeot), the attractive, sexually charged wife of Gareth, seeking a substitute for her frustrations; and Rod (Bill Young) an army and security officer retiree, with delusions of his present capacities. Another couple, Magda (Lizzie Mitchell), a sexually repressed music teacher, and her husband, Luther (Douglas Hansell), a turbo charged male looking for some outlet for his life frustrations, are also added to the mixture of dilemma at Bluebell Hill. The social and cultural observations are hilarious in their mundane details and we certainly sense the sexual discontent of the neighbourhood, and gradually come to see what tragic extremes, to satisfy and subjugate these basic animal needs, all the characters participate in, consciously and unconsciously, to find what they perceive is happiness. NEIGHBOURHOOD WATCH is, principally, a study of Hilda, who, driven by her deep seated sexual frustrations, channels her energy into her religious faith in Christ, and transmutes it to her mission to save all from 'evil'. Her growing desperation converts her actions as the second-in-command of the Neighbourhood Watch, having manipulated her weaker brother into the role as titular leader, to impinge her growing fascistic obsessions onto the relatively naive, or meek and unassuming others. In an escalating construct of black farce Mr Ayckbourn takes us, the audience, into a fierce comedy, that has us laughing at the "ridiculous" situations he puts his ordinary people in, while we intellectually gasp at the preposterous developments, recognising the possibility of the 'truth' of it all. The climax of the play has Martin, the rebelling brother, dying in a hail of bullets from a hovering military helicopter while brandishing at it, a statue of Christ. One of the characters, later remarks, "Who would have thought that Jesus could be mistaken for a lethal weapon?" Such is the vehemence of Mr Ayckbourn's vision with this provoking play. The production at the Ensemble led by Director, Anna Crawford, in a simply neat Design of a living room (hung over by swathes of barbed wire, ensnaring decorative lighting globes) by Amanda McNamara, with attractive lighting by Peter Neufield, and all the action supported by a very efficient Sound Design by Daryl Wallis, is extremely competent, and, mostly, captures the intention of the writer. I had quite a good time. What prevented this production reaching a fuller potential, I thought, was a lack of focusing of the journey of the principal driver of the action of the play, Hilda, so that we can more transparently perceive her gradual, and then, vulgarly obvious manipulations of the others in the play. Hilda is as benignly active, as say, that notorious creation Mrs Bucket, nee, "Bouquet"- played ruthlessly by Patricia Routledge, in the television series, KEEPING UP APPEARANCES - and this, Ms Press does well. But, that she does not shrug this illusion off, as Hilda goes through metamorphic change, during her desperate course in the play, to reveal the monster that is Hilda, - rather like the Livia Drusilla in the 1976 television adaptation of Robert Graves, I, CLAUDIUS (played, famously, by Sian Phillips) - and help us watch this growth, almost as co-conspirators, some of the play's effect is lost. Instead of growing in malignant stature throughout the play, Ms Press tended to remain curled over, bent in disguise, instead of unfurling the 'evil' that Mr Ayckbourn step-by step reveals - a 'gorgon' with no mythical trappings, a 'monster' of magnificent menace! For the attentive, the opening monologue delivered by Hilda at the funeral service to her brother, glitters with all the clues to this woman's pious mendacity. The bulk of the play is told in flashback, and the final reveal of sexual manipulation by Hilda of the innocent and abused Magda, is the final flourished daub to the portrait of a true, contemporary horror that is Hilda. Hilda is simply the latest of Mr Ayckbourn's villains, and is, indeed, the 'sister' to of one of Mr Ayckbourn's earlier creations, that of Karen Knightley in THE REVENGER'S COMEDIES (1989). Both these women, Karen, and Hilda, are in a relentless pursuit of power, and their self interest is fanatical to the point of perversity. The crafty techniques employed by Mr Ayckbourn, lead us into much gleeful laughter, resulting from the casual dialogue and activities of these women, and so makes us part complicit in the events, even, conspiratorial to their development, because we don't stand up and protest the 'evil' of these truly power-hungry personalities. In NEIGHBOURHOOD WATCH Hilda, bedazzles us with the seeming innocuousness of her activities in the moral void that Bluebell Hill transforms into under her 'watch'. Brian Meegan as Martin, gives a brilliant display of the technique that Ayckbourn requires, to succeed: a precise handling of all the text, (his breath and articulatory control, a marvel) and a Chekhovian depth to the character. That this Martin is not, perhaps, initially, a little weaker under the thrall of Hilda, in this production by Ms Crawford, does present some confusion for the audience to the ultimate psychological journey in the play. I believe, that Martin is really an intimidated 'worm' that gradually turns against his sister's power, and is crushed, radically, for it. Mr Meegan's Martin is too confident and attractive, instead of someone who blossoms from a sexually repressed, ordinary bloke to a wooing aroused male, who under the glowing 'come-hitherness' of Amy, grows, to develop the courage of his own right to happiness, as his own man. At last, defying Hilda, at the age of 50 - a small miracle happens! The development of this journey in this production is not as clear on stage, as it appears to be written on the page. Gillian Axtell, as Dorothy, gives a quintessential Ayckbourn performance - the awful normalities, pettinesses of Dorothy are so accurate as one could suspect that Ms Axtell could be playing herself - let's hope not. Too, Jamie Oxenbould is extremely insightful as 'weird' Gareth, and judges his satiric effects with a very fine balance - this actor seems to me, puzzlingly, under-used in the bigger picture of our Sydney theatre scene - this performance was a 'gem'. Olivia Pigeot assisted by a set of outrageous costumes hits her marks with scintillating brio. The underdevelopment of the relationship between the two outsiders to the neighbourhood watch team, the husband and wife, Magda and Luther by Lizzie Mitchell and Douglas Hansell is, too, a weakness in the production. Ms Mitchell, Mr Hansell and, also Mr Young as Rod, present a too literal reading of the actions of their characters, and do not have the necessary complications of observed character - that is, the kind of Chekhovian detailing in backstory that Ayckbourn demands. They gives us no subtext that would justify their complicated motivations for their actions. Mostly, they are contented with blustering generalisations of text and physicalities. Servicable but, ultimately, dullish - diminishing the writing opportunities of the Ayckbourn oeuvre. To play Ayckbourn it is necessary to value the task as a complicated opportunity to play in depth in the Stanislavskian/Chekhov field of play, as preparing artists. Chekhov always declared his observations of his domestic worlds as comedies (including, his short stories) and it is necessary to approach Ayckbourn with the same level of commitment to the revelation of motivation in the sub-textual lives of Ayckbourn's characters and situations. There is a tragic-comic element to all his plays as palpable as that of Chekhov. This is what makes Ayckbourn great, and not just a writer of 'boulevard' entertainments. It is what the revivals of Mr Ayckbourn's work has been substantiating in the past years: that these are classic observations of humanity in his work, that are timeless and universal. History had seemed to have decided that Stoppard and Pinter were the great writers of this period and Ayckbourn, more simply, just the popular one - an appellation that Mr Ayckbourn does not eschew, rather, self-deprecatingly, embraces. There is , however, growing admiration as to the 'greatness' of Ayckbourn, as time advances, and the body of work, survives intact, and flourishes in revival after revival. The 2009 production of THE NORMAN CONQUESTS that triumphed both in London and New York heralded a serious rethink and appreciation. Pinter and Ayckbourn had admired each other, we are told in the biography of Alan Ayckbourn, by Paul Allen: "Pinter and Ayckbourn grew up in entirely different worlds. .... but both playwrights start as realists, observing the world in which they live, and then turning the heat up on their characters. Ayckbourn invites us to see comedy in the personal politics, Pinter the menace. Ayckbourn creates infinite variation in narrative form, Pinter refines it. But each deals with brutality observed but not necessarily explained. Each is pretty determined to have the words spoken as they are written for the very good reason that rhythms and sense and style have an organic relationship with content, and have been crafted with care and purpose." (2). There is much reason to enjoy the title of the Paul Allen biography of Alan Ayckbourn: GRINNING FROM THE EDGE. Indeed, his plays attest to that grin from the edge of his society. It is this that has required me to write so substantially about this production of NEIGHBOURHOOD WATCH at the Ensemble Theatre. 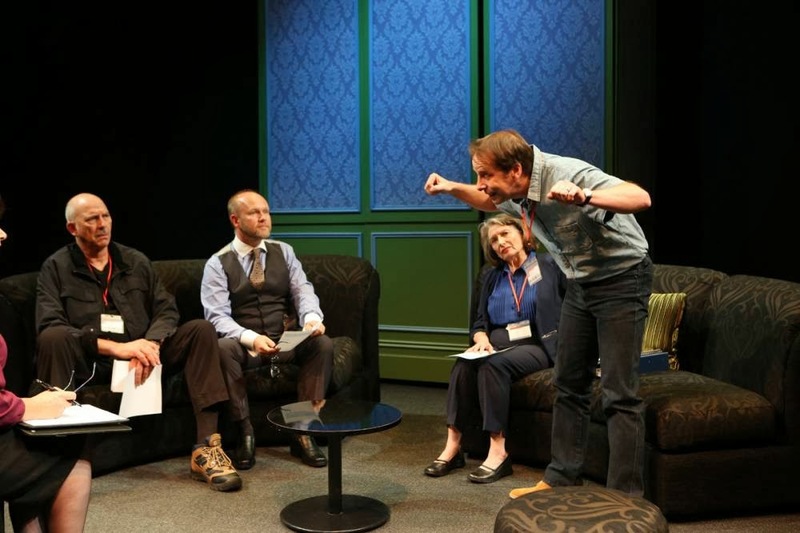 There is a world of joy and acerbic revelation for audiences in the plays of Ayckbourn and I wish to see many of the other plays on Sydney stages. In the above list of plays there are many that I have not seen, and what I would consider major works, that reflects a strange neglect by us, of a great artist: A CHORUS OF DISAPPROVAL; A SMALL FAMILY BUSINESS; THE REVENGER'S COMEDIES, for instance. There are also some plays that should be seen again, and wouldn't it be a treat to see THE NORMAN CONQUESTS again. It is a long time ago, that Old Tote production at the Seymour Centre, but memories do linger and pine for revival of acquaintance, I reckon. This production of NEIGHBOURHOOD WATCH at the Ensemble was appetising, and looking at their Subscription Season, one is tantalised by much that they are offering. If the production rigour continues to grow and continues with confidence there are several plays that pull my attention (I have to confess that in recent times, I have sometimes attended work at the Ensemble, that I deserted at the interval, because of a dissatisfaction in the performance: acting and/or directing - money, and worse, time, wasted!) Two wonderful international plays, seen at the Melbourne Thetare Company, but not in Sydney: CLYBOURNE PARK by Bruce Norris and OTHER DESERT CITIES by Jon Robin Baitz, for instance. The rest of the season is arresting, as well, with new directors, for this theatre, presenting work at this venue, with an expansion of the company of actors that are usually seen on this stage. It looks encouraging. The Ensemble represents a tenacity to survive as a constantly performing arts body, and I feel, I hope, that a renaissance of status, to challenge the others on the other shore of the harbour, is on the horizon. About time, I reckon. P.S. I thought of the workings of Alan Ayckbourn and NEIGHBOURHOOD WATCH while watching the latest Martin Scorsese film, THE WOLF OF WALL STREET, written by Terence Winter, based on the Jordan Belfont memoir, a potent satirical black comedy, reflecting the moral void that the United States appears to be 'floating' in. The extreme situations that the characters play in, are as outrageous and just as dangerously funny, and just as stringently 'scary". It is, perhaps, just an accident of timing, of coincidence, for me to draw such a parallel. 1. ALAN AYCKBOURN by Michael Holt - Northcote House, 1999. 2. ALAN AYCKBOURN ; GRINNING FROM THE EDGE by Paul Allen - Metheun, 2001.